^ Q2 2013 vital signs (PDF). （原始内容 (PDF)存档于2015-01-21）. ^ WMATA Summary - Level Rail Car Performance For Design And Simulation (PDF). wmata.com. WMATA. 2013-10-13 [2014-10-15]. （原始内容 (PDF)存档于2016-01-14）. ^ 4.0 4.1 WMATA History (PDF). WMATA. [2009-01-26]. （原始内容 (PDF)存档于2009-02-06）. ^ La Vigne, Nancy G. Visibility and Vigilance: Metro's Situational Approach to Preventing Subway Crime (Research in Brief) (PDF). National Institute of Justice, U.S. Department of Justice. November 1997. ^ La Vigne, Nancy G. Safe Transport: Security by Design on the Washington Metro (Chapter 6). (编) Clarke, Ronald V. (editor). Preventing Mass Transit Crime. Criminal Justice Press. 1996. ISBN 1881798283. ^ Metro Transit Police. WMATA. [2006-08-19]. （原始内容存档于2008-12-08）. ^ Sullivan, Emmet G. Hedgepeth v. WMATA, et al. (PDF). United States District Court for the District of Columbia. 2003-09-30. ^ Layton, Lyndsey. If You Have to Go, Perhaps Soon You Can Go on Metro. The Washington Post. 2003-01-05: C04. ^ Metro steps up security as a precaution after foiled London terror plot (新闻稿). WMATA. 2006-08-10. （原始内容存档于2011年6月15日）. ^ Lena H. Sun. Metro to Randomly Search Riders' Bags. The Washington Post. 2008-10-28: A01. ^ Appeals court decision: Brieant, Charles L.; Newman and Straub, Circuit Judges. Brendan MacWade and four other Plaintiffs v. [[Raymond W. Kelly|Raymond Kelly]], Defendant. www.aele.org. Americans for Effective Law Enforcement. 2006-08-11 [2009-11-07]. 引文使用过时参数coauthors (帮助); 网址－维基内链冲突 (帮助) Original complaint: New York Civil Liberties Foundation. MacWade v. Kelly (PDF). findlaw.com. FindLaw. 2005-08-04 [2009-11-07]. ^ News Q & A: MTPD Security Inspection Program. WMATA. [2009-01-27]. （原始内容存档于2011-06-15）. ^ Bruce Schneier Talks Metro Bag Searches. The Washington Post. 2008-10-31 [2009-01-27]. ^ Dr. Gridlock. Discussion Overdue On Metrorail’s Bag-Search Policy. The Washington Post. 2008-12-07: C02. 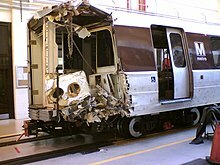 ^ Railroad Accident Report: Collision of Washington Metropolitan Area Transit Authority Train T-111 with Standing Train at Shady Grove Passenger Station, Gaithersburg, Maryland, January 6, 1996 (PDF). National Transportation Safety Board. 1996-10-29 [2009-01-27]. ^ Sun, Lena H. Dozing Operator Blamed in Rail Accident. The Washington Post. 2006-03-23: A01. ^ Metro: Train operator not using cell phone – wtop.com. Wtopnews.com. 2009-06-25 [2009-07-16]. （原始内容存档于2009-06-27）. ^ Metro Trains Collide; At Least 1 Dead. Myfoxphilly.com. [2009-07-16]. ^ Photos from the scene. Myfoxdc.com. [2009-07-16]. ^ 9 Killed, 76 Injured in Deadliest Disaster in Metro History|ABC 7 News. Wjla.com. 2009-06-23 [2009-07-16]. （原始内容存档于2010-12-04）. ^ Two trains collide inside rail yard (新闻稿). Washington Metropolitan Area Transit Authority. 2009-11-29 [2009-11-29]. （原始内容存档于2010年2月4日）. ^ 28.0 28.1 Weiss, Eric M. Federal Investigators Question Metro's Safety. The Washington Post. 2007-01-09: A01 [2009-01-27]. ^ Sun, Lena H. Metro Says Operator Wasn't First to Detect Derailment. The Washington Post. 2008-06-11: B01 [2009-06-24]. ^ John Hughes. Washington Metro Train Operators Caught Texting Will Be Fired. Bloomberg.com. 2009-07-09. ^ 33.0 33.1 Metrorail Fares. WMATA. [2009-01-27]. （原始内容存档于2011-08-25）. ^ General Manager’s Fiscal 2008 Proposed Operating and Capital Budgets (PDF). WMATA. 2006-12-14 [2009-01-27]. （原始内容 (PDF)存档于2011-08-25）. ^ How to Use Metrorail Faregates, Farecards, and Passes. WMATA. [2009-01-27]. （原始内容存档于2016-11-08）. 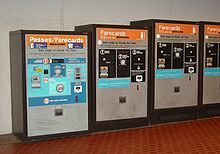 ^ Metro Pass and Farecard Options. WMATA. [2009-01-27]. （原始内容存档于2009-01-30）. ^ Important Information about SmarTrip. WMATA. [2009-01-27]. （原始内容存档于2009-01-30）. ^ Tyson, Ann Scott. 10-cent fare hike proposed for Metro. Washington Post. 2010-01-08: B1 [2010-01-08]. ^ Metro Board approves Rush Hour Promise, service guarantee begins tomorrow | WMATA. www.wmata.com. [2018-09-28] （英语）. ^ Metro details improvements to meet future capacity needs. WMATA. 2008-04-18 [2008-12-08]. （原始内容存档于2011-04-29）. ^ 41.0 41.1 Dulles Metrorail is Coming (PDF). Dulles Corridor Metrorail Project. April 2008 [2009-01-25]. （原始内容 (PDF)存档于2008-02-27）. ^ Gardner, Amy. Silver Line To Dulles Wins Crucial Federal Okay. The Washington Post. 2008-12-04: A01 [2008-12-07]. ^ Project Timeline. Metropolitan Washington Airports Authority. [2009-09-14]. （原始内容存档于2005-11-30）. ^ Metro Long Range Planning. National Association to Restore Pride in America's Capital. [2009-01-25]. ^ Whoriskey, Peter. Choke Point Slows Orange Line Trains. The Washington Post. 2005-04-15: B01. ^ New Rail Service, Franconia-Springfield to Greenbelt（綠帶站至法蘭克尼亞-春田站的新服務，圖上以「棕線」顯示） (PDF). WMATA. October 2008 [2009-01-25]. （原始内容 (PDF)存档于2009-02-06）. ^ Smith, Leef. Metro Studies Ft. Belvoir Extension. The Washington Post. 2005-05-20: B01. ^ McGowan, Phillip. Fort Meade proposes Metro extension. The Baltimore Sun. 2005-06-09. ^ Sun, Lena. New Push For Metro Station in Alexandria. The Washington Post. 2008-06-06: B01. ^ 50.0 50.1 Shaver, Katherine. Leggett Endorses Light-Rail Plan. The Washington Post. 2009-01-23: B03 [2009-01-26]. ^ Where Would the Purple Line Go?. Sierra Club. [2009-01-26]. （原始内容存档于2005-11-02）. ^ Overview – The Purple Line. Maryland Transit Administration. [2009-01-26]. （原始内容存档于2009-02-07）. ^ The Corridor Cities Transitway. Montgomery County Planning Department. [2009-01-26]. ^ Major Transit and HOV Improvements. Metropolitan Washington Council of Governments. 2008-11-19 [2009-01-26]. ^ Paley, Amit. Dyson Pushes Light Rail, Expansion of Bridge. The Washington Post. 2005-02-15: SM01. ^ Sun, Lena. Transit Plan on Track. The Washington Post. 2008-07-13: C01 [2008-07-13]. ^ Laris, Michael. Streetcar Plan Has Money and Desire. The Washington Post. 2008-01-14: B01 [2009-01-26].